Me 'N Me Mates: Lachy Bruce, Chris John and Ezra Juant. Me ‘N Me Mates comprises local musicians and singers Chris John, Ezra Juanta and Lachy Bruce, who recently saw a performance by distinguished folk performer and songwriter Ted Egan and invited him to be their guest for this show. Opening with the rousing “Ryebuck Shearers”, the Mates immediately set the atmosphere of country pub or woolshed, supported by a set decorated with farm implements, RM Williams-wear and Bluey the (inanimate) dog. Bruce’s atmospheric musical backing on guitar and banjo was occasionally supplemented by the others on lagerphone, washboard and harmonica. 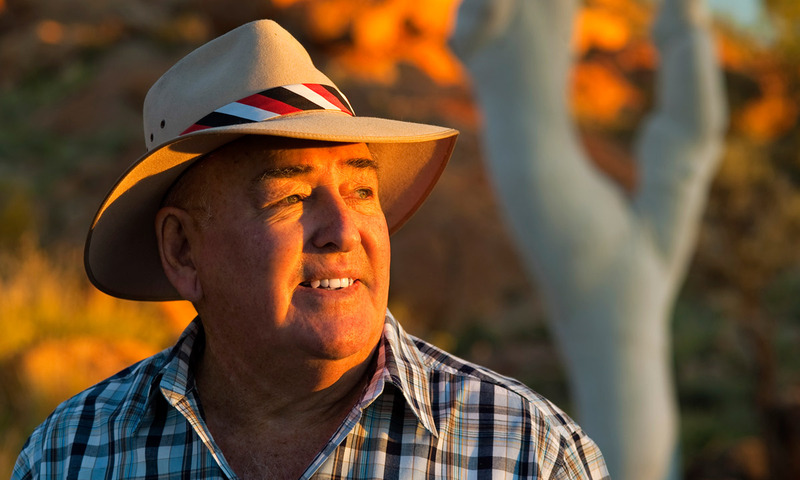 John and Juanta moved between poem, song and story, covering a wide range of subjects, from “the evocative ‘Diamantina Drover” to the tale of three blokes at a barbecue and an ode to Bluey the dog who could do anything but talk “and he wouldn’t if he could”. Egan’s solo sets were a study in professional performance from a songwriter and collector of Australian culture over many decades. His life has been filled with experiences of such variety, and the accumulated wealth of knowledge about Australia and its people, that audiences were captivated from the outset – whether he was telling stories, addressing great social issues or presenting his original and thought-provoking songs, accompanied by his trademark “Fosterphone”. Ted Egan shares the stories of ordinary – or extra-ordinary – Australians. He responded to the many requests from his audience and presented classics such as “Drover’s Boy”, the story of Aboriginal women who masqueraded as boys in order to escape the laws about women working as drovers, and “Sayonara Nakamura”, detailing the accidental death of a contracted Japanese pearl shell diver in Western Australia. Egan’s passion is for those (often women) who are the “backbone of Australian life”, such as the female “boss drover” who took over from her father at the age of 16; or the Queensland woman with six children who did everything for her community, yet didn’t think she was important. He wants to tell their stories, the stories of ordinary Australians, first Australians, recording the best as well as highlighting the less attractive side of our society. Finishing all together with “The Road to Gundagai”, Ted Egan with Me ’N Me Mates had the audience enthusiastically with them. The Adelaide Fringe season of Ted Egan with Me ’N Me Mates at the Goodwood Institute Theatre has now ended.